I can't deny these are good tortilla chips. But Sonia and I have a small problem with them. We don't know how they want to be eaten. On one hand, they are salty and savory, with pumpkin seeds and corn flour. The back of the bag says to dip them in "any salsa or even a yogurt-based dip." You mean like a Spinach and Kale Greek Yogurt Dip?? The problem with that is that there's nutmeg and cinnamon on these chips. How often are you craving Greek yogurt, kale, cinnamon, and nutmeg all at once? I don't know. Maybe there's a type of yogurt dip they're thinking of that's just escaping me right now. 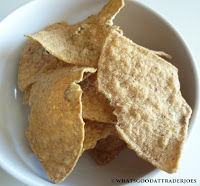 Now, I did try these fascinating tortilla chips with spicy, traditional tomato-based salsa. It worked just fine because the heat and flavor of the salsa easily outshined the subtle cinnamon seasonings on these snacks. If you only ever had these chips with spicy salsa, you'd hardly even know they were anything other than plain old corn tortilla chips. But I also tried them with Pumpkin Pie Spice Cookie Butter. And that worked, too. Magically, they were transformed into dessert chips in a way I'm not so sure plain tortilla chips could pull off. In this latter case, I think the cinnamon and nutmeg helped seamlessly blend the chips with the cookie butter. 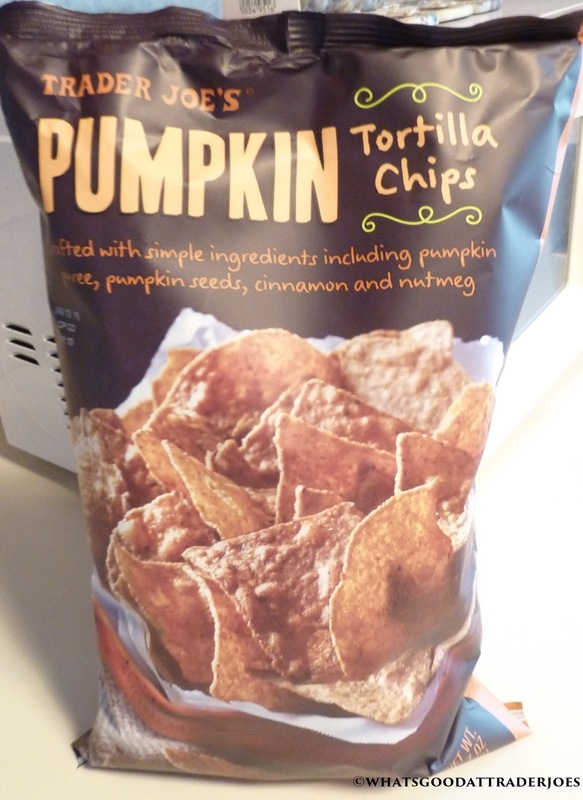 When eaten plain, the chips feel and taste like basic tortilla chips, but then there's the definitely-detectable presence of the above-mentioned pumpkin spices—yet there's no innate sweetness. It's a bit confusing for my tongue. It's almost as if these chips don't know who they really are or what they want to be. And this isn't the first Trader Joe's product we've come across that's had an acute case of dissociative identity disorder. But then there are those of you who will insist that I praise the versatility of this product, rather than dismiss it for straddling both sides of the fence. You wouldn't be wrong. For that reason, I give them four stars. Sonia isn't convinced. She wants them to be one thing or the other, and for that reason, she gives them only three stars. Who's right? Are these chips too creative for their own good, or does their weirdness make them wonderful? Let us know in the comments below! I strongly disagree with this review. These chips are awesome. They are the one thing that is Pumpkin that are NOT loaded with sugar and other junk ingredients. I can actually taste the pumpkin in these and they have a home-made rustic kind of taste. Please, we have enough sugar in American foods as it is. Don't demand for more. They go well with the Fall Harvest Salsa. Is there anything that cannot be turned into pumpkin?! Why'd you remove your comment? Those were great ideas! 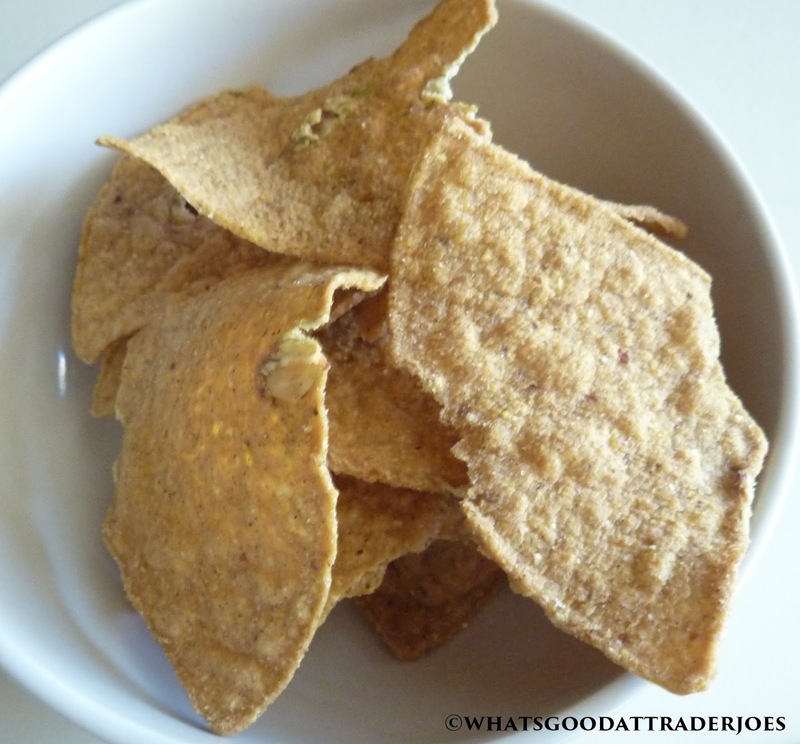 "These chips were awesome with TJ's creamy hummus AND TJ's Muhammara dip! " Would these be good with guacamole, or is that a stretch? Yeah, guac might work...I think it would probably overshadow the flavor of the cinnamon in the chips. I too was a little confused by these. I knew I loved the taste - but I wasn't loving them with the Harvest Salsa and Guacamole. So I just ate them plain and loved them for what they were. THEN I added them crushed on top of my quinoa/sweet potato/black bean chili. Game changer. It was the perfect combination. I'm suddenly feeling a craving for quinoa sweet potato black bean chili with pumpkin tortilla chips on top! Their store article suggests dipping them in pumpkin Greek yogurt. Maybe, but I thought that yogurt was over the top alone, let alone with another pumpkin-esque addition. I'd try vanilla maybe, or honey yogurt. If I had ginger yogurt, they'd be in there no question. I LOVE these chips & have also been wondering what kind of dip would be great for them. I did a quick search & came up with several options that sounds great with them....guess I'll have to try them as well to know for sure. Caramelized Onions & Cheese dip, Pumpkin Ginger dip and a couple other sweet dips to make a more desert type situation.